We all know that Linden Lab will choose their own path for Sansar development in 2018, but here is one way of reading the pulse of the current creators who are a part of the Sansar Open Creator Beta. 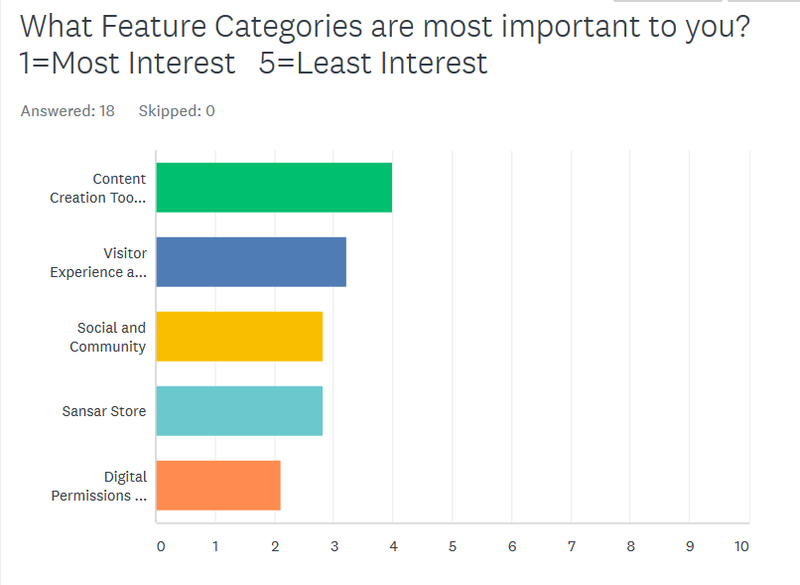 To summarize the responses from this question: “What missing feature might influence you to consider leaving Sansar if it never gets implemented?” Here is a look at what will be the deciding factors to make people leave Sansar. These answers may be a way to see into the hearts of those who will come into Sansar in the near future and what may stand as obstacles to visitor and creator retention. Below is what was written in the survey response field. Full avatar customization. By this, I mean actually being able to swap out the human mesh and replace it with a different one of any stature or size (within reason). I should be be able to be a short penguin, or a very tall dragon. Other platforms like High Fidelity or VRChat already make this possible, but not Sansar! This is an essential feature to letting people identify how they wish in their virtual world. While loading times you can’t do anything. Feels like I am waiting a lot. And I can’t stop process if I decide I wanna quit. Not in lookbook nor while loading an experience, there should be a function to quit without shut down. Bigger font / readable UI. Animation, and the ability to sit. It is direly needed. API does not get any more features. There are those creators who stand on a virtual platform in Sansar and just start creating. They are the true artists of the virtual world. This is of course after they have created mesh in any one of a variety of 3D software. Once created and textured with materials, the mesh is then exported as an FBX file to their computer’s hard drive for temporary storage. Switching over to Sansar, they then import the mesh models into their inventory within Sansar and then they place the object onto the platform that I mentioned at the beginning. Items that are organic in nature such as trees and rocks and water and grass can easily be arranged by pushing and dragging them wherever the artist thinks they look best. Setting an exact location or size of mesh models is not often critical when making a scene that looks like nature. For those creators who make buildings and furniture and things we sometimes think of as the “built environment”, it often becomes a bit more critical to place things on a grid of sorts. We may never see the grid, but it is hidden in the exact placement as coordinates. It can even include the height above or below the platform we started with. This sort of creating is what I call building. And those who build things wish to know where those objects are in a more precise way than the organic artists that I mentioned earlier. The builders of virtual buildings arrange things is a precise way according to concepts learned from their Real World experiences. And for them I made the 3 axis arrows to help them see where they are going in a graphic way. Still missing for these builders in Sansar is the ability to snap things to edges or vertices of adjacent objects. It would also be helpful to have a visible ruler that would allow us to snap things to precise coordinates without needing to calculate where we wish things to be placed and then entering those coordinates into the edit window using a numeric keypad. For anyone who is interested in voting for features like this, please log into the Sansar forum and vote for this feature request “Snap”. It was first posted on September 10, 2016 and at that time Widely Linden replied: “Yep. It’s on its way. In the mean time try toggling the “Surface Snap” option. It’s pretty handy!” Well, the “Surface Snap” only works when we first introduce a new object from our inventory into the scene. After that it does not function. and there is still no ruler. Here we are 16 months after “Snap” was first requested and the focus of Linden Lab for 2018 will turn from creator tools toward user engagement and retention. All creators must join the chorus and gently remind the product team of the creator tools that are long overdue such as rulers and “Snap”. Linden Lab has not said that all development of creator tools will stop, but we need to remind them of our expectations.